Look at the back-cover credits on cd reisssues of the great Blue Note jazz recordings of the late 1950s through the mid 1960s. There you'll see: Butch Warren, bass. His solos and comping are aural textbooks on how to play bass in the hard bop idiom. I particularly appreciate and enjoy his work on Dexter Gordon's Go! Mr. Warren has not been well for quite some time now, only occasionally playing gigs in the D.C. area. One afternoon in 2004, I ran into him by chance. He was sitting by himself at Franklins Restaurant and Brewery in Hyattsville, not appearing to be in good shape. He was NOT drinking the pub's beers but was slurping a diet soda. He told me he didn't have his bass anymore. No one at the pub was aware of his career. But, from Marc Fisher's blog below, I've learned that Mr. Warren had not really lost his bass. Local jazz pianist Peter Edelman kept it for him during difficult times. And that's a wonderful thing. A bassist's bass is his alter ego; I can only imagine the hurt he might feel if it had been lost. The good news is that Butch Warren is playing again! He has a regular gig with Peter Edelman every Wednesday at Columbia Station in the Adams Morgan of Washington, D.C. I'll be there. Edward “Butch” Warren, a Washington-born bassist who performed on celebrated albums of the modern jazz era before vanishing almost completely from the music scene because of drug addiction and deteriorating mental health, died Oct. 5 at Holy Cross Hospital in Silver Spring. He was 74. Durham, North Carolina-based All About Beer Magazine invited folks in the trade (like me), press, and friends to the Brickskeller in Washington, D.C. on Thursday afternoon to celebrate with them the relaunching of its magazine. 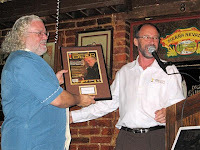 That's a photo of publisher Daniel Bradford (on the right) giving a plaque to Dave Alexander, host of the event and the owner of the Brickskeller, which is itself 50 years old this year (not Dave). On the plaque is a reproduction of the cover of the new issue ... and a photo of Dave! More photos. Against a fascinating slideshow backdrop of covers and stories from All About Beer issues of years past, we enjoyed a big food spread. Daniel then took the stage to regale us with stories of the magazine. The magazine was founded in 1979. When he and Julie Bradford purchased it in the early 1990s, issues had often been published haphazardly, and sometimes stories could be as far afield as what constituted a good hunting knife! Daniel then introduced his staff, as well as the firm which did a lot of the creative work on the new design - a firm based in the DC area. The magazine has a glossier look and feel, and masthead. Among the many attendees were Nick Matt of F.X. Matt/Saranac (wearing the suit and tie to the right), Greg Kitsock and others from Mid-Atlantic Brewing News, reps from importers Legends, Ltd. and Phoenix Imports, Ltd., local brewers from Gordon-Biersch (Jason Oliver who brought his wood-chipped Schwarzbier), District Chophouse (Barrett Lauer with his barleywine), Vintage 50 (Bill Madden brought a cask of Molotov Hoptail) , Dogfish Head (rep Devon Arloski and head brewer Andy Tveekrem with several beers including their neo-Berliner Weisse Festina Peche), Sweetwater Tavern Merrifield (the brewer's name has slipped my mind), and Clipper City (me with a firkin of our Hang Ten Weizen Dopplebock). I took the opportunity to chat for awhile with Mr. Matt. I found him to be quite a gracious patrician of the beer industry. 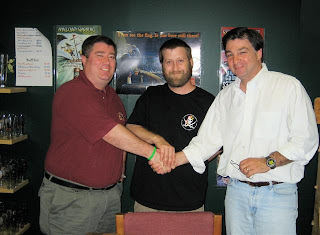 Hugh Sisson, owner of Clipper City Brewing, was not able to attend due to a prior commitment. Years earlier, when he had owned and operated Sisson's Brewpub in the Federal Hill neighborhood of Baltimore, Julie and Daniel had enjoyed one of their first dates together there. The rest is published history. The original plans, created by architectural firm HOK, for the Nationals' new ballpark included space designated for a brewpub. Not a themed bar, but an actual on-site brewery! I had never heard any mention of this until recently when I was told by someone who had seen the plans and sat in some meetings with HOK. He has asked to remain anonymous. What's the status of a brewpub at the ballpark? And what is the zoning legality? He didn't know. There is no mention of a brewpub on the official Nationals website. 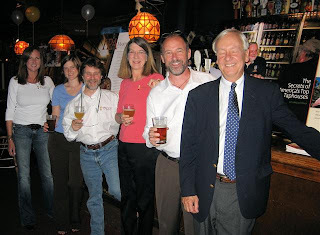 That's Tom Kehoe (on the left) and I at the Great American Beer Festival in Denver in October 2006. I first met Tom and then-partner Jon Bovit in Philadelphia in 1996 when I was brought on nearby as the original brewer for the Manayunk Brewing Company. Yards Brewing was tiny back then: a cramped 2-room house, the back wall of which was supported by the earth of a hill. Open fermenters were cooled by a home air-conditioning unit. Some of the equipment had been bought from the Oxford Brewing Company of Maryland (where I had earlier worked as a brewer and then brewery manager). But ahh, the beer - the flagship ESA (Extra Special Ale)! Distinctively fruity and piney, copper-colored, hints of spicy cedar wood, with a firm malty/toffee backbone. After some frustrating days of construction work at Manayunk, I would enjoy hand-pulled pints at the nearby Dawson Street Pub. And Tom was often forthcoming with technical help and advice. 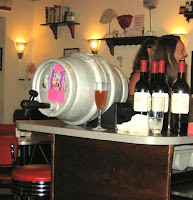 Between the efforts of Yards and the proselytizing of beer writer Jim Anderson (now proprietor of a hotel in Scotland), cask ale could be found in many locations throughout Philadelphia. And that was 1995/96! I wish Tom Kehoe success, wherever he may move Yards. One esteemed brewing alumnus of Yards is Brandon Greenwood. In the late 1990s, he was the lead brewer when Tom moved the brewery to more spacious digs in Roxborough. Greenwood, a Heriot-Watt graduate, is now the brewmaster for High Falls Brewing (formerly Genesee). In a recent World Beer Cup, his JW Dundee's Pale Bock won the gold medal for German-style Heller Bock. Brandon has emailed me with this correction. Brandon was never the Brewmaster at High Falls. 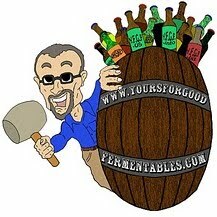 Dave Schlosser is the Brewmaster and the Pale Bock is his creation. Apologies! 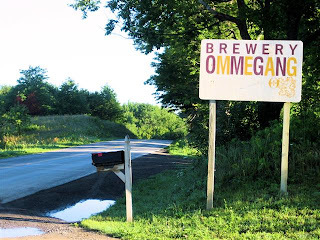 I'm just returned from Cooperstown, N.Y. Well, actually from Milford, NY, where just outside the town limits you'll find Brewery Ommegang. It's a 7 hour drive from Baltimore, Maryland. My traveling companions were Celebrator Magazine beer writer Chuck Cook (if it's Belgian, Chuck's there!) 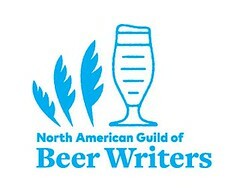 and Mid-Atlantic Brewing News beer writer Stephen Lipps (his beat is Washington DC). Let's get to the point: real fruit beers will not necessarily be sweet. That's correct: beers fermented with fruit will not, ipso facto, be sweet beers. Think about it. If fruit beers were by definition sweet, then wouldn't all wines, fermented with fruit, be sweet as well? When fruit is used in the fermenter, the yeast will consume those fruit sugars. That's with beer just as it is with wine. If a fruit beer is sweet, chances are it really isn't a fruit beer at all. Rather, it probably is a flavored beer: extracts, syrups, or chemical essences of some sort have been added to it. A beer fermented with real fruit often won't taste wholly like that fruit. It'll taste like fermented fruit. Not quite a tautology, that's a subtle but important distinction. Refer, again, to wine. A good wine is rarely described as tasting like grapes. There are some fruits, such as cherries or raspberries, that do impart distinguishable flavor after fermentation. Other fruits, such as watermelon, blueberries, strawberries add only a slight, generic fruitiness. If a beer tastes like watermelon, it's a flavoring added to the beer; if a beer tastes like pumpkin, it's not the vegetable, it's 'pumpkin' spices. There is a common misconception that lambic beers, produced in Belgium, are, as a class, sweet and fruity beers. Lambics, comprised of sizable amounts of wheat in their grists, are spontaneously fermented beers. As a result, they are suffused with acetic and lactic acids produced by native yeasts and bacteria. Some lambics are indeed additionally fermented with fruit, commonly raspberries or cherries. But the fruit sugars in those ferment out fully - imparting more sourness and flavor - not sweetness. That being said, yes, there are some sweet flavored gueuze-lambics. These have been sweetened after fermentation with fruit juice, and then pasteurized. These 'beer cocktails' are what many folk mistakenly refer to when they talk about lambics. I recently read a complimentary piece on Clipper City Brewing's Oxford Raspberry Wheat on-line at Beer Advocate. Observing that the beer is not sweet, the article noted that the beer is not a lambic, but an American-style wheat beer. Real raspberries are added to the fermenter where they are consumed by the yeast. The beer has a wine-like finish but not the intense sourness of a lambic. Oxford Raspberry Wheat has a long pedigree. Born in 1991 at the now defunct British Brewing Company (later renamed Oxford Brewing), it is the original and oldest fruit beer brand of the East Coast. When that brewery folded in 1998, Clipper City had already been contract-brewing the bottled version of the beer - true to the recipe. Clipper City continues with the same recipe today. ... or at least close to it. This morning, I'm traveling up to Brewery Ommegang for the Belgium Comes to Cooperstown Festival. It'll be three days of camping, good beer, good food. My driving companions, there and back, are Chuck Cook, writer for Celebrator and Ale Street News, and Stephen Lipps of Mid-Atlantic Brewing News. I'm becoming a Jeff Wells marketing flack ... but good beer is good beer. And it's more better when served by someone who knows how to present it. Such as Jeff. Earlier YFGF posts about Jeff Wells. 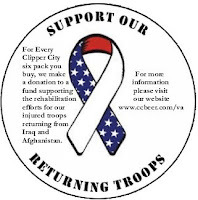 Hard Times Café franchise owner Randy Barnette confirms publicly that Clipper City Brewing Company will now be brewing Hard Times Select Lager for the Washington, D.C. area restaurant chain. He also shares his opinions on the future direction of Coastal/Old Dominion Brewing Company , the prior, long-time, brewer of the chains' beer. Well, thought I'd join the list finally after seeing so much info from here make it over to the realbeer forums etc. I'm not a frequent poster there but a few of you may recognize me. I'm a franchisee with Hard Times Cafe (Woodbridge). I also got a call from Mike over at OD [Old Dominion] yesterday. I've got good money on their never being a OD beer festival again without Mike there to run it. They are really hell bent on destroying the local flavor of ODBC. My opinion is they just want the brand name and the ability to start hawking one particular beer regionally or nationally like Red Hook, who cares about anything except the OD Ale or whatever they decide to concentrate on. Not only are they stopping REAL Oak Barrel Stout and New River Pale along with both of the Tuppers' but they are no longer brewing Hard Times Select Lager for us (or any other restaurant contracts....only interested re-labeling their beer). That represents FOUR GABF medal winners. Just today I finished working out the transition of our beer to Clipper City. I believe Hugh Sisson, Tom Cizauskas and their crew will do a very good job at representing the Hard Times brand for us. If things continue like this there is definitely a void left for someone to come in with a new regional brewery and reclaim the OD market. I think the way things are going there's going to be some long term ill will towards ODBC by the craft beer crowd around here. Maybe Dogfish will fill that mark, they have another location in the Ashburn area they plan to open after Falls Church (I lost a potential restaurant site to them). It was our place in the sun for years ... and now it's closing. The Blue Surf Motel, at the intersection of Bethany Beach boardwalk and the town's 2-block main drag, has been sold. It will be closing in September. Bethany Beach is a sleepy, small beach town on the DelMarVa coast; it was our family's summer vacation spot from 1968 onward. In 1999, many family members, extended family members, and friends of the family cam back to Bethany to celebrate my parents' 50th wedding anniversary. We only stayed in the Blue Surf a couple of times, but it has always been a friendly landmark. I'm saddened to see it go ... it takes with it a lot of comfortable memories. Million dollar condos will take its place. Yesterday, Ken Griffey Jr. hit home run #587, passing Frank Robinson for sixth place on the career home run list. He is 15 behind Sammy Sosa for fifth place. Griffey - he of the "sweet swing" - has had several unfortunate years of injuries which have prevented him from being further along. Frank Robinson is one of the all-time great players, and a classy guy. The manner of his dismissal as manager from the Nationals was handled with gross lack of class by the team. And, I might add, the Nationals through their proxy - Aramark - have refused to sell local beer in RFK. Sunday, Senator Jim Webb appeared on NBC's Meet the Press. Webb debated Senator Lindsey Graham (R-SC) on the civil conflict in Iraq. SEN. WEBB: No, I don't think that there is a war, to start off with. I think that this has been a botched occupation. It's been going on for four years after the purely military part of it was done. This administration has failed in terms of bringing the right diplomatic formula to the table. We -- all of the things that people like myself were predicting would happen if we went into Iraq are the -- exactly the sorts of things that the president and the small group of people who have sort of rallied around him are saying will happen if we leave. We were saying that Iran would be empowered, we were saying that international terrorism would be empowered, we were saying that the reputation of the United States would be diminished around the world, and we were saying the region would become more unstable. So we've reached the point, and I see, with what Senator Warner and Senator Lugar have introduced, that there's a good, strong feeling among the Republicans as well, we've reached the point where we have to come together as a Congress and attempt to bring some order into this. Napa Valley became the first American wine region to receive protection for its name by the European Union. Oh no, he didn't say that ... well, yes, he did. His point may have been that other Belgian breweries were making abbey-style beers as good - or in his opinion, better - than the monks of the seven beer-producing Trappist breweries. And, yes, there are Belgian breweries outside of those cloistered walls that do make wonderful dubbels, tripels, etc. And, yes, there are breweries outside of Belgium that do the same. But if that were the only argument in favor of removing trademark protection from the monks, it would miss the point. I would rather trust those good brothers to continue their good brewing traditions - and with a protected appellation - than trust businesses designed to maximize profits to do so. One datum point? Look at InBev and see how it debased Leffe. Now comes a bill in the Wisconsin legislature to revamp a Prohibition-repeal era restriction that had forbidden breweries in that state from owning more than two locations to brew and sell their own beer if they had produced more than 4,000 barrels per year. This was put in place in the 1930s(!) to prevent hegemony by large breweries to the detriment of smaller local brewers. But these days, 4 thousand bbls is relatively insignificant in regard to the 115 billion barrel production levels of the big boys (e.g., Anheuser-Busch, Coors, Miller). Maryland has a obliquely similar restriction which forbids a brewery - of any size - from holding more than one brewing license. The Capitol City Brewing group was caught by this law a few years back, when it attempted to open 2 brewpubs in Maryland: one in Baltimore's Inner Harbor and one in downtown Bethesda. It was told that had to cease operations at one, and chose the Bethesda location, assuming, correctly, that the Baltimore spot, with its tourism traffic would be more profitable. Unfortunately, that success has led to higher rent, and the group has decided to close down that pub. Another Maryland group, the DuClaw chain, produces draft beer at its main brewery and sells that to its several non-brewing pubs: a hub and spoke concept. Of course, it can't do that directly, as it must sell the beer to a distributor, and then buy it back, with all the price add-ons that go along with such. As a personal note, this concept is somewhat identical to that promulgated in 1997 by my friend Joseph Marunowki, when he was the Director of Operations of the Local Brewing Company in Westlake Ohio, and I was Brewmaster. 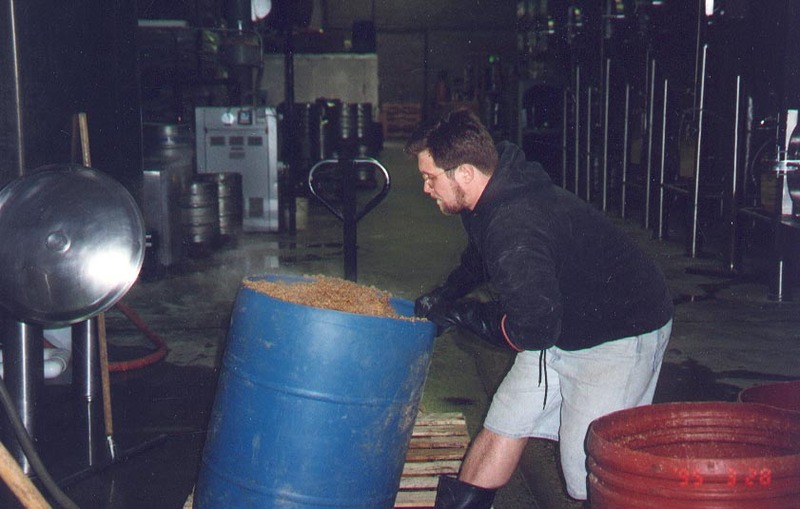 The picture is of Joe wrestling with the spent grains at the now defunct Oxford Brewing Company, circa 1994. The proposed bill will increase exemption to 10,00 barrels - that's one step forward. But - two steps in reverse - it will mandate that each location serve at least 40% food over beer, and that all locations serve either draft beer or from bottled beer - not both. Thus if you would want to add a production facility to bottle the beer that you've been producing draft-only at your brewpub, you would be required to serve food at your bottling facility, but you would be forbidden from serving draft beer at your brewpub. Huh? Several small breweries and brewpubs held a protest yesterday afternoon in Milwaukee to bring attention to this illogical bill. They cracked the bungs on old-style kegs (Hoff-Stevens) and allowed the beer to spray out into the Milwaukee River. Call it sort of a (not Boston Tea but) Milwaukee Beer Party. The bill is being publicly discussed today in committee; representatives of the Wisconsin Brewers Guild will be there. I wish them good luck. From Michael Horne's blog MilwaukeeWorld: The committee has adjourned without taking any action on the bill. Chef Gillian Clark sparked some controversy a couple of years back in the Washington Post and on-line when she opined that the customer is NOT always right. (By the way, she serves some of the best French toast I've ever tasted.) 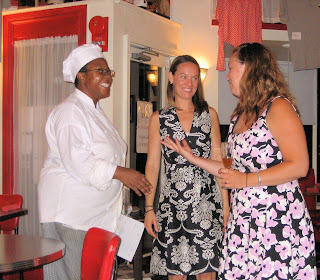 Her Colorado Kitchen is an intimate, fun, and innovative restaurant in northwest DC. Here's an interesting concept dinner she recently created: The Battle of the Barrels. She prepared a menu of six courses, each paired with one specially chosen beer and one specially selected wine. Kristin Orr of distributor Legends, Ltd. selected the beers; Ali of Henry Wine Group selected the wines. I was on hand, bringing a pin of Clipper City's Loose Cannon Hop3 Ale, which was served with the Lemon Pound Cake dessert. A pin is a small cask - in fact, at 5.4 gallons (42 US pints), it's exactly half the size of the more common size of cask - a firkin (10.8 US gallons). So the gist was: you ate, you drank, and then you decided which paired better with the meal - the wine or the beer. Ever since reading about a similar event in Garrett Oliver's excellent book - The Brewmaster's Table - I have been intrigued by his format of a beer/wine 'slam' dinner. But I have been utterly unsuccessful in urging it upon ANY restaurateurs in the Baltimore / Washington area. That is, until recently, when Ms. Orr suggested it to Chef Clark who obviously took to the idea. Vidalia Onion Mini Burgers, Fried Zucchini, Creamed Shrimp Hash in Puff Pastry. 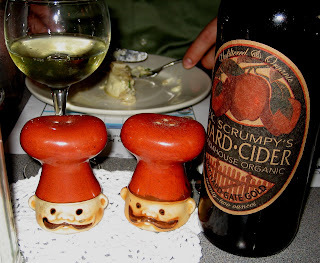 my notes: The website for the cider states that this Scrumpy actually isn't a scrumpy. So why name it scrumpy (which is strong 6% abv+ English cider, usually served from a cask)? Most US hard ciders taste to me like fizzy alcoholic apple juice. This one, organic, was better than most - but still not scrumpy. Read a review of mine of some English scrumpy and perry that had been imported into the US for a short while a few years back. I gave my personal nod, however, to the Sparkling Extra Trocken Riesling ... its bright acidity cut through the just-enough tempura-like batter of the zucchini. By the way, this really was a choice between two wines. Beer is fermented from grain; wine from fruit. Cider, fermented from apples - fruit - should properly be considered a wine. my notes: Being a vegetarian, I didn't taste the meals, but did ask around for opinions. The mousse was a thing of beauty, sort of a flan of crab. The crabmeat itself was Louisianan: sweet in flavor. Thus the Chardonnay, an oaked Napa - malolactic butteriness and oaky sweetness - was probably a better mate for the crab. I'm not a fan of that flavor in wine, so I preferred the La Chouffe, which I think is a marvelous beer. It has a crisp grainy character, a lemony zest aroma, and a whiff of sweet cooking spice. The brewery was purchased by Moortgat (brewers of Duvel) in late 2006; its US distribution/importation networks may soon be changing. my notes: The wine was definitely a funky Riesling: to me aromas of gasoline, sweat, Rose's lime juice ... but those are good things! The Skullsplitter - even though I thought it was tasting a bit old - matched so much more appropriately with the barbeque: chocolatey, smoky, malty. my notes: I've never had this beer before, just its smoked-malt brethren (Aecht Schlnerkerla) - beers that figuratively taste of bacon. So, from the same brewery, this helles was a delightful surprise: soft, with a softly sweet breadiness, and only a hint of smoke adding counterpoint in the background. Pouring with only a few toads-eye bubbles, the sample had been, I believe, accidentally undercarbonated. From all the "oohs" and "ahhs" for Chef Clark's entrée, I could only imagine how sublime a pairing the beer and flounder made. But ... more at the table preferred the wine: an acidic, biodynamic, Austrian Gruner Veltliner, with what rep Ali described as a food-friendly "green-bean" aroma. It came in an unusual full-liter green bottle, crown-capped like a beer. I've never seen wine in a bottle like that before. my notes: What a wonderful beer - almost cherry fruit, wet stone minerality, lactic acidity. This style of beer - Flanders Sour Red Ale - is often paired with game and fowl in Belgian gastronomy. It may have been a flavor shock to many participants - who chose the Bordeaux over it. To me, the Merlot-predominant Bordeaux was a bit tight. My notes: The Loose Cannon Hop3 Ale was in fine fettle pulled from the cask - if somewhat turbid. But, it did NOT pair well with the pound cake; the beer's citrusy character and structure clashed with the cake. The sweet, low-alcohol (5%) rosé was a better match. I'm a summer season partisan for dry French-style rosés, of which this was not an example. 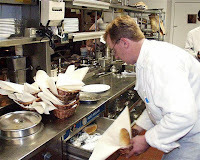 Since the dinner, Clark has closed Colorado Kitchen and opened The General Store in Silver Spring, Maryland. Her name Gillian is pronounced with a hard 'G'. She has published her memoir Out of the Frying Pan: A Chef's Memoir of Hot Kitchens, Single Motherhood, and the Family Meal. Chef/owner Gillian Clark is the host of Wednesday evening's Battle of the Barrels [UPDATE] at her Washington DC restaurant, Colorado Kitchen. In 2004, some comments of hers in the Washington Post fomented a rumpus. Due to copyright restrictions, I can't quote the entire article in question. I have, however, extracted a few salient portions. Chef Gillian Clark has had it up to here. She's had it with customers who order her lovingly prepared food at Colorado Kitchen and then demand hot sauce or ketchup to dump all over it before they've taken a single bite. <...>And she's especially torqued off with people who want to completely sabotage the carefully thought-out entrees she's offering with their litany of demands: Can I have another vegetable, I want a different sauce, can you leave out the garlic, don't use any butter, could that be fried instead of broiled, and, oh yeah, can you cook the beef "rare but with no pink at all"? <...> Four weeks ago, she wrote a letter to Post food critic Tom Sietsema and asked him to post it on his weekly online chat. <...> As for Gillian Clark, she is surprised her letter generated so much anger "from customers who didn't see it from my point of view" - - namely, that of a chef who works 12 hours a day or more, in a kitchen barely big enough for three people, carefully crafting her menus to balance taste, texture, color and the height of flavor from seasonal ingredients. "When you pay a chef, it's like paying a doctor or any professional. You're paying for professional expertise," she says. "Let us feed you. We know how." NBC's Today morning news/entertainment program ran a short piece this morning on "beer is the new wine." Much to the initial bemusement of Ann Curry and two other Today Show hosts, an editor of Food and Wine Magazine talked about pairing beer with food. More restaurants appear to be featuring better beers on their beer lists than occurred even 5 years ago, he said. And some restaurants are even training their waiters or 'beer sommeliers' to offer diners pairing suggestions. 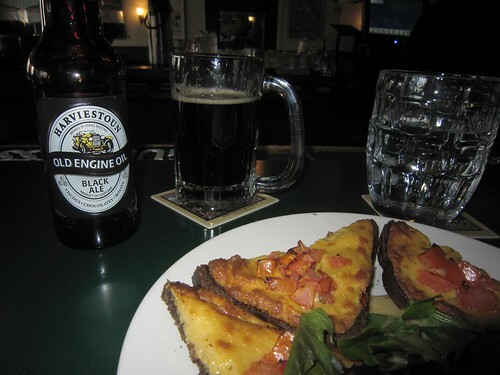 As an example, he noted that the piney edge of hoppy beers tends to cut through the fat of fried foods. And, he said, pilsners and crisp lagers pair well with spicy foods, specifically mentioning Thai shrimp curry. But it wasn't until he poured from the copper-kettle shaped container of Samuel Adams Utopias ($100 bottle of beer, 25% abv) that he seemed to score some points. At this point, the Today hosts began to take several sips! Ann Curry agreed that the beer would be delicious with chocolate. It doesn't exactly taste like beer, she opined. An earlier segment was a demonstration on how to cook beer can chicken. On June 14, Jeff Wells opened Wells Ales & Lagers in Williamsburg, a pub, left, that sells 100 beers, 10 on draft and the rest by the bottle, all of them for retail as well as at the bar and at tables. His establishment is one more addition to the neighborhood’s thriving beer culture. This place, which is announced by a pub sign that was commissioned from an English signmaker, is a simple affair. The bar is made from wood that was reclaimed from a bowling alley, and the chalkboard menu offers cheese and charcuterie, sandwiches and salads: 303 Bedford Avenue (South First Street), (718) 963-3435. 'Til all success be nobleness, and ev'ry gain divine! 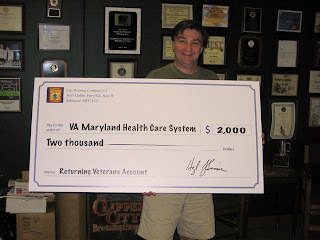 Clipper City Brewing Company's General Partner Hugh Sisson holds the brewery's first donation from its program to support returning war veterans. For more information on this program, click on the badge below. By the way, Hugh will be a guest on WAMU - D.C.'s National Public Radio outlet - on Tuesday 3 July at 1:30 PM. He'll be discussing the beers of summer - and the foods that go with them - along with Cooking with Beer author Lucy Saunders, Jason Oliver of Gordon Biersch, and others, on the Kojo Nnamdi Show. Tune in at 88.5FM or on-line at www.wamu.org.